Christmas may be the most wonderful time of the year, but it also presents one with certain challenges. After all, it isn’t always easy to think of what to give the special people in our lives, especially when on a budget. 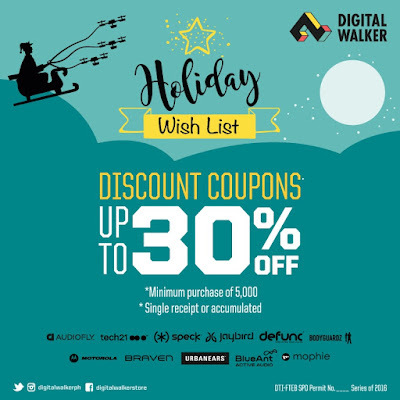 Thankfully, Digital Walker, the country’s largest retailer of premium gadgets and accessories, is making things easier this season by hosting a Holiday Wish List Promo! 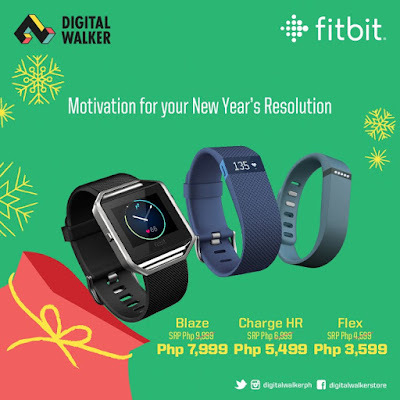 From December 1, 2016 to January 31, 2017, customers who purchase a minimum of only Php 5,000 in any Digital Walker Branch will get 1 set of Digital Walker Christmas Discount Coupons. Customers can expect discounts from a wide selection of brands suitable for both the young and the old, making the season of giving even more enjoyable. Discounts range from 10% off from Jaybird, 15% from Motorola Verve Ones Series, 20% discount from Audiofly, Defunc, Urbanears, Braven, Blue Ant, and Morphie, 30% from Tech 21, Speck, and Fusechicken. There is also good news for running enthusiasts, as prices of Fitbit accessories have dropped as well. The Fitbit Flex is now Php 3,599 (from its standard retail price of Php 4,599), the Fitbit Charge HR is now Php 5,499 (from Php 6,999) and the Fitbit Blaze is now Php 7,999 (from Php 9,999). By throwing their Holiday Wish List Promo, Digital Walker has proved once again that they are the go-to gadget store for everyone’s accessory needs. The discount coupons customers receive may only be used until March 31, 2017 and cannot be converted into cash. One coupon applies to one item of choice only.